Batakamma is a special festival celebrated with religious fervour in the Telangana region. Batakamma means ‘immortal woman’. It is a month long festival where Goddess Batakamma’s idol is worshipped and is made to float on the rivers and lakes. Basically, this is a floral festival. It falls on ‘Asvija Shuddha Dasami’ (September -October).This festival is celebrated to glorify womanhood and her celestial place in the family set up. During these days, Goddess ‘Gauri’ the patron Goddess of womanhood is worshipped by all the women folk with utmost devotion and piety. 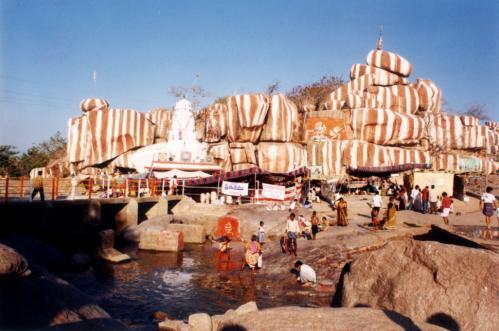 This place is in Medak District and is a sacred spot, where the seven tributaries of the Manjira join and flow together. The annual Jatara held on Mahasivaratri day attracts thousands of pilgrims. 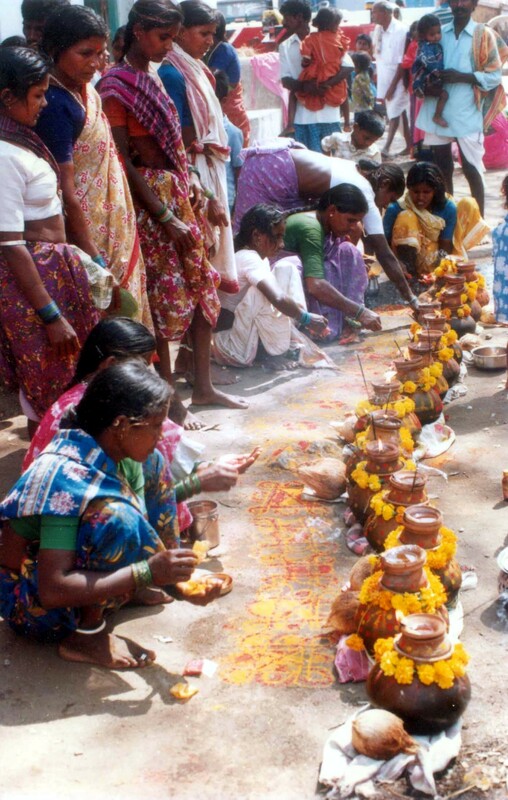 This festival is celebrated by Kolam tribal inhabiting Laindiguda, Utmur Taluq Adilabad district. This falls in the Kolam month of satti. Ayak also known as Bhimana or Bhimdev, is the principal deity of the Kolams. He is represented by a carved wooden mace usually crowned with a bunch of peacock feathers, a pot containing pher or a belt of bells, marwar or anklets and small dolls made of mud. All these are kept in a thatched shed. On a Thursday, the relies of Bhimama are brought and kept in the heart of the village in a small green lead enclosure. On the first day a fowl or a goat is sacrificed. On the following day the relics of the dirty are taken to Mohamloddi, a hill stream about eighteen kilometers from the village for bathing the deity. After bringing back the deity to bath in the evening, a buffalo purchased collectively is sacrificed. The sacrifices are done to fulfill their vows. The meat of the scarified animal is cooked and eaten by all the people of the tribe. First meal is served to all the priests. Cooked jowar mixed with the food of the sacrificed animals, goes around the village, small quantities of it on all the cornerstones and comes back. The deity is taken to its original abode the following day. This festival lasts for three days. It is confined to Kolam tribals only. They do not allow people of other communities to be present at the time of sacrifice. Lambadi – Associated with daily tasks harvesting, planting, sowing etc., the Lambadi is performed by the Ganjaras, a seminomadic tribe seen all over Andhra Pradesh. 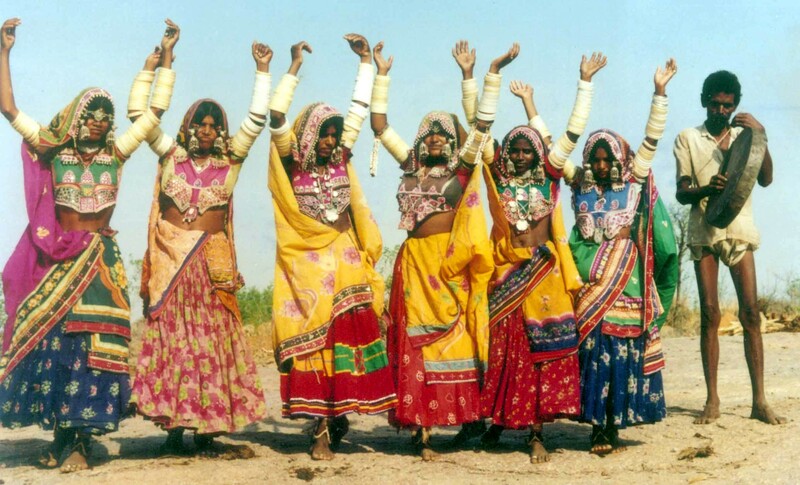 Costumes embroidered with glass beads and mirrors, ornate jewellery, ivory bangles, brass anklets and a natural rhythm make this dance a colourful exposition of joy which is the highlight of many a festive occasion. Gonda – A tribal dance performed by youths, it is a joyous celebration of the victory of Lord Krishna and Lord Rama over the demons. The festival activities in the Telangana are marked by spectacular fireworks, and the burning of the effigies representing the vanquished demons. Dear AVMM & family: The articles are excellent. It has come out of her understanding & love for our culture. Keep encouraging her. The effort is marvellous. She must have done lot of home work to describe our festivals precisely. All that effort and sources that guide the young mind into understanding our culture and roots as they grow is a path & guidance for our young Indians toget to know about our great culture. It is a Great Effort and needs appreciation. With her Zeal & Enthusiasm, she is capable of producing many such useful articles. She needs every encouragement & support. Very good effort Ashritha. I wish you good luck. The article is well composed and informative. Great presentation. This article is indeed well researched, well written, well presented and kudos to you for picking a subject of this significance. I wish you good luck and best wishes for all your future endeavours which will not only earn you good name and fame but also make your parents, other kith and kin proud of your academic and extra-curricular achievements. Excellent presentation and great effort at this tender age. Wish you all the best. all the best ur bright future. Hi ashritha sorry for late response,just now i saw ur article it was really wonder ful.I like ur way writing it is very well.Have bright future. Telangana people are foolish with low IQ, check out the idiot called Telangana Channel (#18) , he is requesting info on Telangana movement.Haha ,with google and wikipedia at his disposal ,he doesnt know where to look,perhaps he is illiterate like most Telenganas and some treacherous Andhra is writing for him. If it were upto me ,all Telangana people would be in jail as they are criminals by nature. ప్రణవమయమైన ప్రక్రుతి అంతరాలల్లో సహజంగా ఉండే విశ్వమయ ప్రాణశక్తి (cosmic power )తో కూడిన ఒక ఓషధ దుంప పసుపు(turmeric) ఈ పసుపు లో పట్టిక నిమ్మరసం కలసినచో స్వచ్చమైన కుంకుమ తయారవుతుంది. సత్వ,రజ,తమో గుణములయన ఈ మూడు పదార్థముల రహస్యమెరిగి సహజ సిద్దమైన ప్రకృతిలో అదృశ్య సిద్దులు పొందిన సమ్మక్కసారక్కలు మనకందించిన అద్భుత వనమూలిక యుక్త పసుపు కుంకుమలు పవిత్రమైనవి. కలియుగములో సర్వ మానవాళిని ఏకం చేసే సంకల్ప శక్తితో కూడిన వన దేవతలయన సమ్మక్క సారక్కలను పూజించిన అద్భుత వన మూలికలు పసుపు కుంకుమలను పంచలోహము తో నిర్మించిన గుండ్రని పెరిమేడ్ ఆకారం గల భరణి లో నింపి ఉంచిన అందులో సుక్ష్మంగా ఒక రహస్య జీవశక్తి (science of bio – energy)ఉత్పన్నము ఆవుతుంది.! ఆభరణి లో శక్తి రూపం లో నున్న పసుపు కుంకుమలు మనము ఆరాదించే సమ్మక్క సారక్కలు కావున వీటిని ధరించే వారికీ అన్ని రకాల విఘ్నములు తొలిగి ఆయురారోగ్య ఐశ్వర్య ములతో ఇహపర సుఖములు ప్రాప్తించును. శ్రీసమ్మక్క సారక్క వనదేవతలను ప్రసన్నం చేసుకొనుటకు ఈ అద్భుత వనములికల యుక్త భరణిలను పొంది మన జీవన విధానాన్ని చక్కని బాటలో పయనింపజేసుకొనుటకు సమస్యల పరిష్కారము కొరకు సుఖః శాంతులు నింపు కొనుటకు సంపుర్ణమైన భక్తీ విశ్వాసములతో మన ఇంట్లో నిత్య పూజ గదిలో శాశ్వతంగా ఉండేలా ప్రయత్నిచడం మన కర్తవ్యము. Hello, I am a journalist, and i would like to talk to you about the festivals that are unique to Telangana. Could you please let me know which mail ID I can reach you on?